This 60+ page e-book will show you many ways to be more productive. AutoCAD is meant to be customized, but customization is one of the most complex features of AutoCAD. Gain the knowledge you need to be a master at customizing AutoCAD! Get this valuable customization information all in one place now! 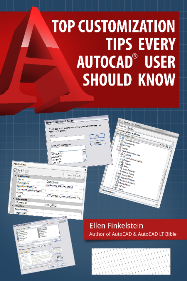 Ellen Finkelstein has been using AutoCAD since 1986, teaching it since 1989 and writing about it since 1992. She is the author of the best-selling AutoCAD & AutoCAD LT Bible, which started with Release 14.